William was born in 1892 at Newbury, the son of Henry Wickens and his wife Louisa née Flicker. 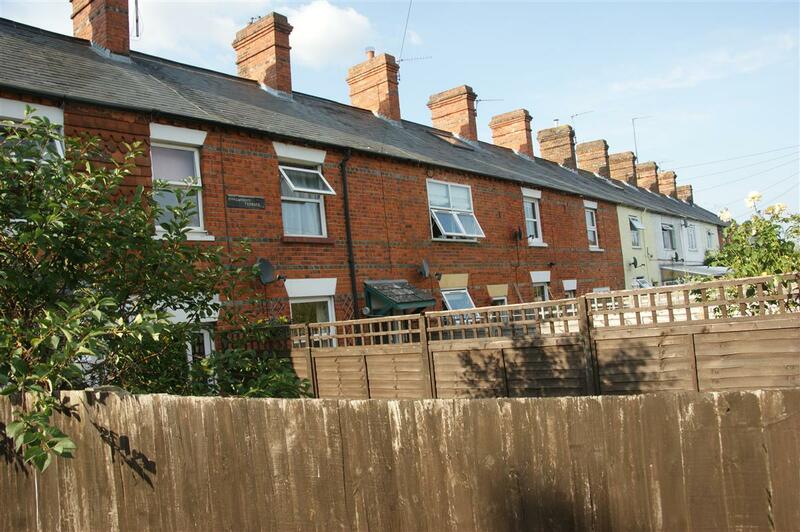 He was the fourth of their six children, the others being Elizabeth (born 1885), George (1887), Louisa (1889), Francis Joseph (1898) and Sidney (1902) The family lived at Shrewsbury Terrace, Buckingham Road (Nos 1, 8 and 12 at various times) and in nearby Kew Terrace. Henry was a gardener, but it is not known which garden(s) he tended. Shrewsbury Terrace - over the years the Wickens family lived in several of these cottages. 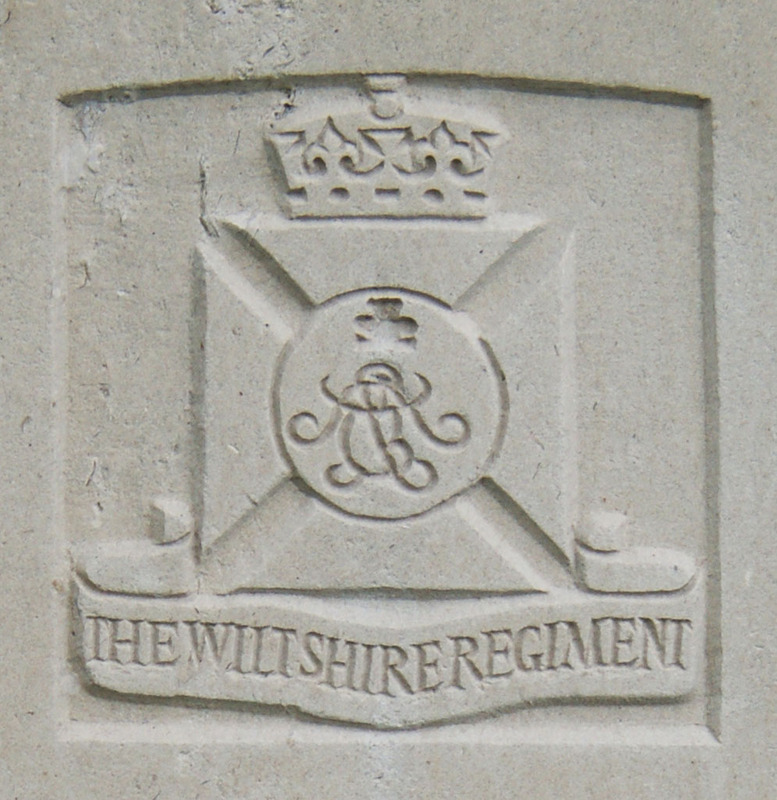 William enlisted with the Wiltshire Regiment in 1909, by 1911 he was a Lance Corporal serving with its 2nd Battalion (2nd Wiltshires) in the garrison at Dublin. In 1913 the battalion was sent to Gibraltar to form a part of the garrison there. When war was declared on 4 August 1914 a large number of the Regular Army battalions serving in garrisons around the Empire were recalled to England; as the 2nd Wiltshires were relatively close they were among the earlier arrivals landing at Southampton on 3 September. After a short time in England where the battalion joined up with other units to form a part of the 21st Brigade, 7th Division, the entire Division (around 20,000 men) crossed to France in early October, the 2nd Wiltshires landing at Zeebrugge on 7 October. This was the first British division to arrive in at the Western Front having returned from the Empire, but not the first from the Empire; the Indian Army’s Lahore Division travelled directly to France landing in Marseilles in late September. By the time the 2nd Wiltshires got to France William was in the rank of Lance-Sergeant; not really a sergeant but a corporal acting as one. It is entirely possible that this increase in responsibility came when the battalion topped up its peacetime manpower (probably around 500-600) to its full fighting strength of almost 1100. The additional men would have been recalled Reserves, there may well have been a shortage of Sergeants leading to the need to advance some of the more reliable Corporals to Lance-Sergeant. All these new troops were desperately needed, the German advance into France had been checked at the Battle of the Marne and the French with a little help from the small forces of Britain and Belgium had pushed them back towards Belgium. Meanwhile the Germans were set on completing their conquest of Belgium by pushing west to the coast – at the same time outflanking the Allied forces. The 7th Division landed as this so-called Race to the Sea was ongoing, they entrained for Bruges then moved to Ostend where they covered the evacuation of a division of Marines who had been sent to reinforce the Belgians at Antwerp arriving there on 6 October only to see the garrison surrender three days later (the 7th Division had also been sent to bolster the Antwerp defence, but had arrived too late). Before long Zeebrugge, Bruges and Ostend would all be in German hands. By 24 October the Division had taken responsibility for a portion of the British line to the east of Ypres (Ieper), the 2nd Wiltshires being positioned around the village of Terhand, which they occupied on 18 October when the small German force in occupation left without a fight. 21 October No attack was made but a heavy artillery fire on support trenches, which were occupied by half of D Company under Capt Henslow, continued at intervals until dusk. During the night supports took up position on extreme left of Battalion. 22 October Extremely heavy artillery fire commenced about 7.30am again along support trenches, which were now occupied by 6 men and Sergt Smart of Machine Gun Detachment who supplied C Coy with ammunition. This fire was evidently intended for Artillery at rear. At noon enemy made an attack and advanced to about 200x from trenches, losing a large number of men, our machine guns (two) doing considerable damage. During the afternoon enemy tried to mass in wood opposite Battalion’s left flank also in Wood across BECELARE road opposite right flank but were met especially on left, with such heavy infantry fire that their dead were literally piled in heaps, our machine guns again doing excellent work. About 4pm the enemy enfiladed D Company’s from the left with a heavy artillery fire for about 1½ hours only killing 1 man but doing considerable damage to the trenches. During the night the enemy entrenched within 450x opposite left flank in front of wood. 23 October The enemy bombarded the whole of the trenches with heavy artillery fire, doing considerable damage both in casualties and destroying trenches. During night the firing on both sides was comparatively light occasional shots only being fired. The Battalion was re-inforced early in the evening by about one company of Scots Guards. 24 October About 5.30am (just before daybreak ) the enemy attacked in a very superior force, but were driven back with heavy loss. They attacked again, and after about 2 hours of almost continuous fighting in which the enemy lost hundreds in killed and wounded they broke through the lines having previously contrived to come round on our left through trenches that had been vacated. With the exception of about 30 NCOs and men mostly from trenches on right the remainder of Battalion were either killed or captured, a large number being captured. Corporal Alderton who had escaped from trench on left of BECELARE road together with Privates Dunn, Holister and Jones being apparently last to leave the trenches, gathered stragglers together and formed a rear guard to Brigade Ambulances by opening out in skirmishing order. On arrival at 7th Divisional HQ he was met by Cpl Bull, and in the evening the APM took party numbering 26 back to Brigade HQ where they met Cpl Richens and 50 men which included about 12 Lce Cpls. The majority of these men had been driven from their trenches by artillery fire the previous evening. The Quarter master hearing that Lieut Macnamara was wounded, visited him at the Field Hospital and afterwards about 4pm collected the 50 men above mentioned taking them to Bde HQ and was informed that no news of Battalion had been received since early morning. Note: Special mention should be made of the gallant worth of Capt Comyn, the medical officer and stretcher bearers who for the last three days and nights were continuously handling wounded or burying dead. 25 October: Stragglers numbering 90 having being joined by about 15 during night were marched from Bde HQ under Sgt Moss transport Sgt to 2nd Line of Transport where they bivouacked and were reformed under QM Lt S Hewitt and SM Waylen who heard the following day that he and Regtl QM Sgt Reeves also Col Sgts Wells, Russell and Dale had received their commission dating from the 16th inst. 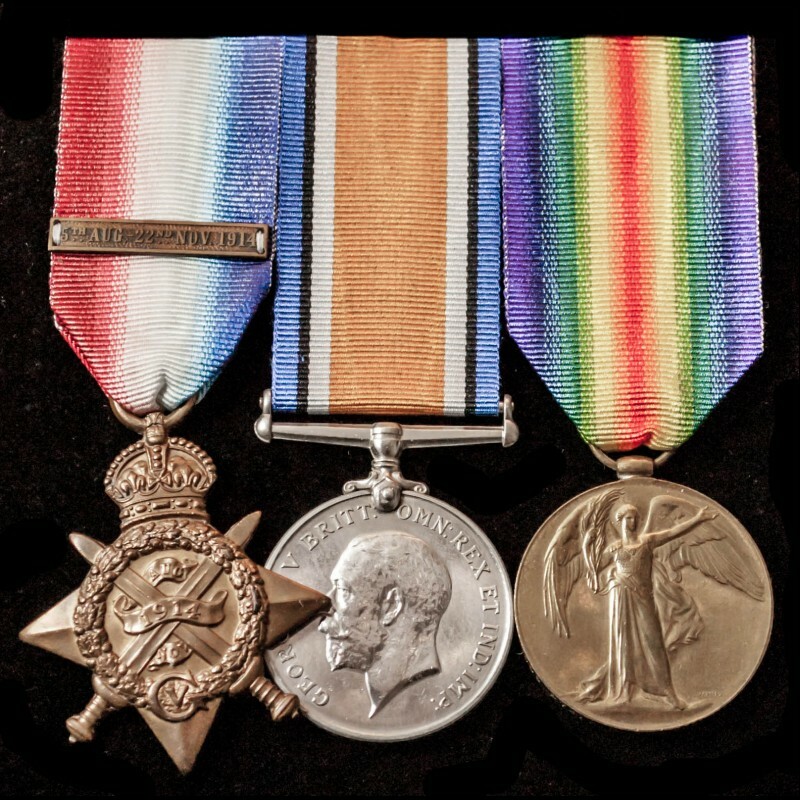 The medals that would have been awarded to William - this specific set being earned by a colleague from the 2nd Wilts who died the same day at Reutel. The Battalion had all but been wiped out, the majority of the survivors being backline troops from transport sections. Mr and Mrs H Wickens, of 1, Shrewsbury-terrace, Buckingham-road, Newbury, after over a year of anxiety and suspense as to the fate of their second son, Sergt William Wickens, have now received an official notification from the War Office which states that he was killed in action on October 24th, 1914. Sergt Wickens had served for five years with the 2nd Wilts Regt, previous to the outbreak of hostilities, and immediately the declaration of war was made, the regiment, which was then stationed at Gibraltar, proceeded to England. For upwards of a month they remained at Lyndhurst, near Southampton, and were then drafted out to France, where they arrived in early October. A notice stating that Sergt Wickens had been missing since October 24th, was soon received by his parents, and now twelve months later, comes the news of his death on that day. Coincidently another local soldier, Pte Horace Barden, son of Mr and Mrs Barden, of Queen’s-road, who was also in the 2nd Wilts Regt, has been missing since that same day, October 24, 1914, but no tidings have been heard of him since. William’s official date of death, as recorded by the Commonwealth War Graves Commission is 24 October 1914; in reality he could have died at any time within those last few days at Reutel. His body was never identified, so his name is remembered in Bay 53 of the evocative memorial to the missing in Ieper (Ypres) – the Menin Gate. Every evening at 8pm the Last Post is sounded under the Menin Gate and every evening hundreds gather to pay their respects to the 54,000 men named on the memorial and the hundreds of thousands of other who lost their lives in the Great War. The newspaper report (above) conveying the news of William’s death also mentions a lack of news regarding Horace Barden. Similar news probably arrived within a few days – Horace’s name is also on the Newbury Town War Memorial and on the same stone on the Menin Gate. 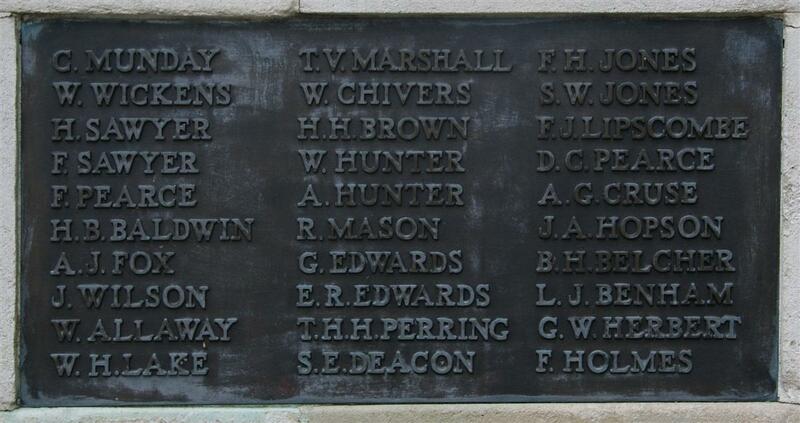 Locally William’s name is remembered on tablet 3 of the Newbury Town War Memorial.